Last night, over the course of several hours, I started the process of packing up in preparation of moving out of my apartment. More specifically, I started packing my books (the most important things come first, of course). As I did so, two thoughts struck me. The first was that my bookshelves (and tables and various other flat surfaces) held a lot more books than I thought they did, and I’m slightly concerned about fitting them all into the boxes I have on hand. The second was the deep, half ecstatic, half frantic realization that I really, truly am about to spend the next four months in another country. 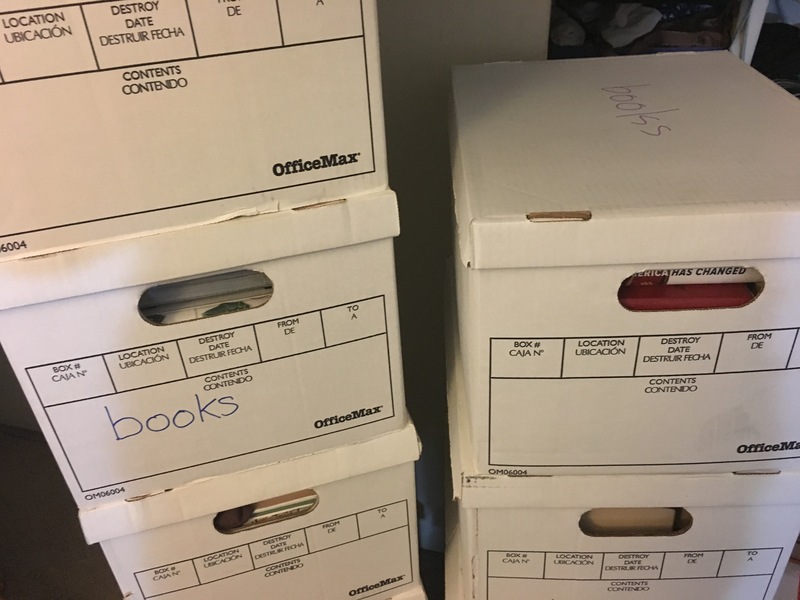 Pictured: five boxes full of books. Not pictured: three additional boxes, just as full. There’s something about packing that is remarkably final. It is, if you’ll allow me to wax melodramatic for a moment, a physical embodiment of imminent change. I’ve lived in my current apartment for more than five years, but in less than three weeks I’ll leave it for the last time, and it will no longer be “home” to me– a strange thought. Upon further consideration, I also realized that it’s the packing of my books specifically that has me feeling this way. I can pack clothes and computer without anything seeming quite so empty. But take away my books and leave my shelves all bare? That’s when you know that something is really going down. Lest I sound like I’m slipping into melancholy, though, let me say that I’m almost giddily excited. It feels a little like it did when I was getting ready to leave for college, or like it did a few years later when I spent a semester abroad. Everything is new. Anything is possible. I have only the faintest idea of what to expect, and, despite what the over-cautious voice in the back of my head is trying to tell me, it’s going to be a wonderful, fantastic adventure. I think I feel a little bit like Bilbo Baggins.